Bernie Sanders was elected mayor of Burlington, Vermont, back in 1981. 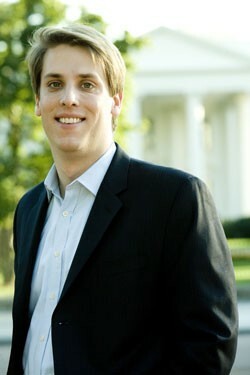 That’s the same year Montpelier native and brand-new political author Garrett M. Graff was born. Today, Bernie is one of Vermont’s United States senators, and Garrett’s debut book, The First Campaign, is on the street this month. And it’s getting favorable reviews, including one by Michiko Kakutani in Tuesday’s New York Times. “The astonishingly young Mr. Graff proves in these pages that he is a cogent writer, willing to tackle large-scale issues and problems,” writes Kakutani. Yours truly remembers first meeting Garrett, son of former veteran Vermont Associated Press Bureau Chief Chris Graff, a decade ago in 1997. He was a high-school intern in the office of then-Gov. Howard Dean. Tall and quiet. No dummy. When I was hired on as a part-time press assistant after my freshman year, I was young enough that the governor’s legal counsel had to make sure I could legally work for them without violating child labor laws. Over the next four years, I spent every afternoon I could and several summers collating news clippings, writing press releases and sending out Dr. Dean’s weekly public appearance schedule. Among ourselves, the small staff often discussed with varying levels of seriousness whether the boss might run for president one day. A few years later, in 2002, during his senior year at Harvard University, young Graff was interviewing for a job with the “nascent” Dean for President campaign, “and I got a glimpse of the barely controlled chaos of a presidential run in its early stages,” he writes. Ten days after he graduated in 2003, Garrett was setting up folding tables from Staples at Dean headquarters over the Vermont Pub & Brewery in downtown Burlington. And that’s where he spent the next nine months. Everybody knows Howard Dean of Vermont did not win the Democratic nomination. He did not become president. But he didn’t do too badly, did he? The former Vermont doctor, now chairman of the Democratic Party, is credited with providing the correct “diagnosis” and the perfect “medicine” that brought his tired Democratic Party back to health and back to holding a majority of seats in the House and Senate. And the Democrats under Howard Dean’s chairmanship are also closing in on reclaiming the White House next November. Hard to argue with results, eh? The First Campaign covers a great deal more than the Dean for President Campaign. Graff goes into depth about the impact globalization and the World Wide Web will have on 2008, in a way they’ve never impacted before. Young Graff, in addition to book-tour speaking events, continues as an editor-at-large for Washingtonian magazine. And yes, he will be home in Montpeculiar for Christmas. The Literary Scene — Had a nice chat Tuesday with Young Graff the author. He’ll “always” have time for “Inside Track,” he told yours truly. And he also agreed with our assessment that he represents a generation that — unlike the one before it — is speaking up and speaking out. “It’s been a very exciting month,” said Graff. “Very, very good,” he answered. His only “bad” review so far was in Rupert Murdoch’s New York Post. Graff’s publisher is Farrar, Straus and Giroux of New York. None too shabby, eh? Graff told “Inside Track” he was “incredibly lucky.” He worked with an agent in Washington, D.C. — Tim Seldes, the father-in-law of a friend. Seldes is something of a legend. And what will the former Dean for President campaign staffer be doing in 2008? “We’re trying to figure out what that’s going to be,” he said this week. Reefer Madness Update — A surprise development last week in the “reefer madness” battle between Republican Gov. Jim Douglas and Windsor County State’s Attorney Bobby Sand, a Democrat, regarding the prosecution of first-time marijuana offenders in Windsor County. In a plea deal, Sand had given court diversion to a first-time, 61-year-old female pot offender who also happened to be an attorney and part-time judge. The guv jumped in Ronald-Reagan style and decreed that, henceforth, first-time marijuana offenders who are busted by state police in Windsor County would be prosecuted by the attorney general’s office. Previously, Sand had bravely spoken out, suggesting lawmakers may want to examine current drug laws, and there are indications that just might happen in the coming legislative session. The sad fact is, notes Sand, we don’t have a better handle on the “drug problem” today than we did 30 years ago. Sand and his supporters suggest that if drug abuse is a health problem, perhaps we should treat it as a health problem. That just might be a more effective use of our taxpayer dollars. While Gov. Scissorhands may have expected his intervention to shore up his law-and-order image for the 2008 election season, it appears to have had the opposite effect. Last week, Gov. Douglas announced he was withdrawing his edict. He said he had been led to believe that Sand had a “blanket policy,” when in fact, Sand had now made it perfectly clear he does not and never did. Of course, Douglas could have confirmed that weeks ago. Sand had been trying to reach him, but the guv, we’re told, wasn’t taking the prosecutor’s call. Yours truly caught up with Gov. Scissorhands at the Dealer.com ribbon-cutting the other day. Nobody does it better! Douglas told “Inside Track” he stood “behind everything I’ve said,” but was clearly eager to move on to other subjects. “Let’s look to the future,” said Jimbo. OK. Whatever you say, guv! The Future Governor? — Looking to the future this fine wintry afternoon in Vermont, we see the rising gubernatorial candidacy of the man who looks to have the best shot against Jim Douglas next November — Progressive Anthony Pollina. According to reliable sources, Pollina for Governor campaign operatives have begun taking steps to recruit paid campaign staff and seek office space. Should become visible soon. Sources say Pollina has been getting good results with his fundraising efforts and encountering plenty of enthusiasm and encouragement. The recent floating of former Democratic Lt. Gov. Doug Racine’s name was less than a genuine trial balloon. Doug is not interested. Trust me. But the Vermont Democrats do want a horse they can back in the race. A horse with a chance of winning. On issues from health care to the environment, Democrats are stymied by the current occupant of the Fifth Floor. Certainly Gov. Douglas will be a strong favorite for reelection next November. But 2008, what Young Graff calls “The First Campaign,” will have an extra-big turnout due to the presidential race, and it promises to be a little different thanks to the World Wide Web. Damage Control — The Democrats who caved to Gov. Douglas on health-care reform tried to make the best of it the other day. They were real short on specifics, but put the best face on it. Next session they want to focus on folks who are self-employed or work for small businesses, have health insurance, but are getting hammered by the cost and the high deductibles. House Speaker Gaye Symington, 52, went for the personal touch, telling reporters and a crowd of lobbyists that last year she underwent “a regular feature of being a woman.” She had a PAP smear. It came back with “questionable results,” said Speaker Gaye, so a second test, costing $2000, was recommended. Senate Democrat Boss Peter Shumlin told a similar tale of rapidly escalating insurance costs at his family’s travel business. No longer does he offer a Cadillac health plan to his workers at Putney Travel, he said. In fact, Shummy said, the press apparently does not consider 20 to 30 percent jumps in the cost of health insurance to be newsworthy. Peter and Gaye said all the right things, promised some sort of bill would pass, though nothing major in the coming session. Despite the legislative leadership downplaying expectations for significant health-care reform measures in the 2008 session ahead, the drumbeat will not die down. Health-care reform advocates, we’re hearing, intend to make their presence felt under the Golden Dome. Vermonters who have health-insurance coverage have been learning this fall that costs are skyrocketing. Until we learn from the rest of the civilized world and go single-payer, things will continue to deteriorate. Does anyone still doubt that? Even more and more doctors are getting on board these days! Last Call — Heard the sweet voice of ex-U.S. Ambassador to Slovakia Skip Vallee this week. The former Republican National Committeeman from Vermont is home after serving as George W. Bush’s ambassador at the embassy in Bratislava for almost two and a half years. Gasoline Vallee is easing back into running the family fuel business: R.L. Vallee Fuels. He also owns the chain of Maple-field’s mini-marts. Ambassador Vallee visited more than 200 towns in Slovakia. In fact, one of the former St. Albans BFA hockey star’s final official acts was to play in a women’s pro hockey game. Skip told “Inside Track” he suited up for a half-game with each side. We asked Skip how much money he had raised for the Bush-Cheney ticket to “buy” the ambassadorship? According to www.OpenSecrets.org, Vallee was a Bush “Ranger” in 2004, having raised more than $200,000 for the campaign. Hey, you get what you pay for, right?